Light floral scent, smells very fresh and clean. I assume that this works as a sunblock, with the low SPF, it is definitely more for daily use of office and even home use. Not for the outdoors activities. 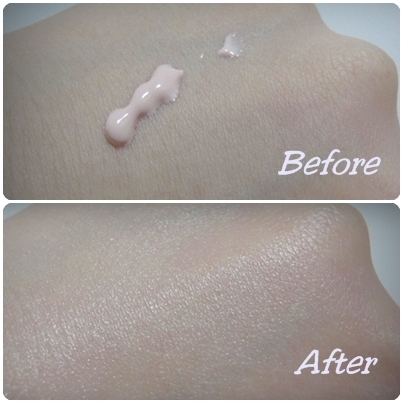 This is definitely becoming one of my favourite indoor sunblock, couldn't really tell the difference at first but after comparing properly, there really is instant brightening effect due to the pink coloured cream. For some reason, I felt that the packaging is rather weird as I though it was an eye cream at first but I'm getting fonder of it day by day. I guess in some ways it might be easier to travel with the elongated size. Of all the things that I've tried, from the mask and the emulsion, I would recommend this the most. Note that I have Normal to Combination skin, so I'm not sure how it would work on other skin types. Again, I don't know the price yet as they will only announce them in October 2012. Looks like something that will make your skin glow. Nice..
Kinda look forward to it. Hope to get it on hand nia. Isabel, yes it does make my skin glow like a korean pop star look. That is why I love this product. Fer Haru, when october comes, we go check the price. Hopefully not too ex. Ferharu, Haha I know right, everybody want to compete with each other. With a good & healthy skin... How I made it? Giveaway | Love your skin! Fun Nano-nano nails with Sally Hansen! Pledge Teh Tarik for Malaysia!